As the majority of the world’s countries have been gathered at the United Nations negotiating the nuclear weapon ban treaty, the Center for Public Integrity has been releasing installments of a new report about workplace hazards at the US nuclear weapon laboratories. Monday’s installment of the report reveals a “litany of mishaps” across the eight sites that involve workers inhaling radioactive particles, receiving electrical shocks, being burned by acid or in fires, splashed with toxic chemicals, or cut by debris from exploding metal drums. Los Alamos National Laboratory, where the plutonium cores for nuclear warheads are produced, has “violated nuclear industry rules for guarding against a criticality accident three times more often last year” than any of the country’s other 23 nuclear installations combined. Before Los Alamos took over the production of the plutonium component for US nuclear bombs, Rocky Flats near Denver Colorado was the nation’s sole facility for plutonium core manufacturing. 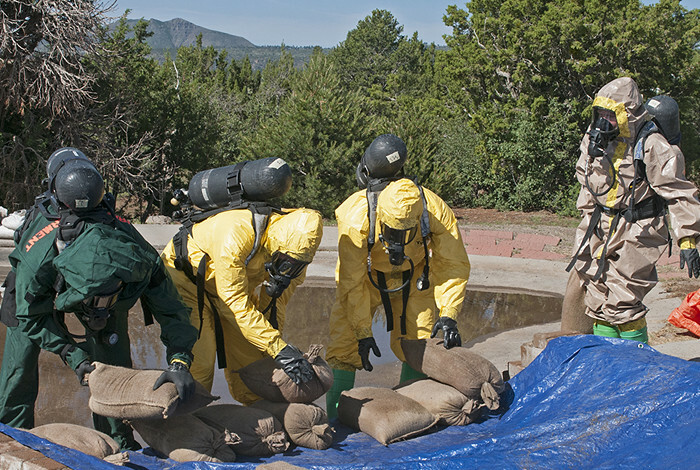 This facility, also managed by various contractors, had multiple fires including two major accidents involving plutonium in 1957 and 1969; on-site storage and burial of transuranic materials in leaking drums and unlined trenches contaminating the land and groundwater; radioactive contamination of nearby creeks and reservoirs; plutonium trapped in building ductwork, missing plutonium and so-called infinity rooms deemed too highly radioactive and dangerous to enter; and the incineration of plutonium contaminated waste—which eventually brought the attention of the FBI, leading to a raid. In 1989, Rocky Flats shuttered its operation, the buildings were taken down, and much radioactivity was borne away from the site, but much remains. The first six feet of level earth were partially “cleaned” of contamination, but below that, any amount of plutonium and other radioactive and toxic materials have been left on-site. The surface of land that comprises the former facility shifts often due to bioturbation, the handy work of burrowing animals. Ecologists have documented the presence of some 22 such species at Rocky Flats. These animals play a significant role in the redistribution and further dispersal of radioactive contaminants that remain in the ground. Despite all of this, in 2017 the re-named Rocky Flats Wildlife Refuge is slated to open, complete with a visitors center, picnic areas and 20 miles of hiking, biking, and riding trails. These cases clearly demonstrate that while a handful of corporations make profits from building the bomb, their workers and the surrounding public suffer immediate, direct health-related costs. Meanwhile the rest of the world lives under the risk of environmental and humanitarian catastrophe. This is where the ban treaty comes in. 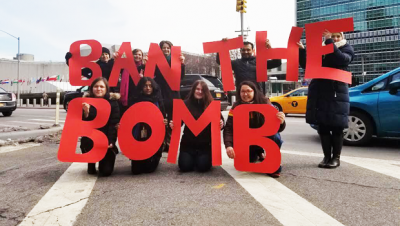 Banning nuclear weapons is a threat to the nuclear weapon complex. Several of the draft treaty’s proposed legal prohibitions—such as on assistance, development, production, manufacture, testing, and of course possession—will impact directly on the economic, political, and social sustainability of this enterprise. An explicit prohibition against the financing of nuclear weapons, as a form of assistance, would be significant in terms of putting pressure on the companies currently running the nuclear weapon labs in the United States and equivalents in other countries. Taking the profitability out of manufacturing weapons of genocide is critical for impeding “modernisation” programmes and diverting human and economic resources away from weapons and towards meeting social needs. Right now, nuclear ban negotiators are waiting for the release of the revised draft treaty text from the conference President. This revised text will be the basis for the remainder of negotiations. We have eight days left to achieve a ban treaty by 7 July. Keeping in mind the physical, economic, operational context of nuclear weapons out in the world is important for shaping an effective treaty inside the conference room. Thanks to Kathleen Sullivan for her contributions to this article.